Not every car comes equipped with a high-end navigation system and safety features, such as those offered by the Renault R-Link, Range Rover Evoque, Ford SYNC, BMW iDrive and other infotainment services. The following top car gadgets will augment your ride to help you find a destination, talk over a speakerphone, and diagnose problems with your vehicle. This high-end hands-free speakerphone clips to the visor in your car and connects over Bluetooth. 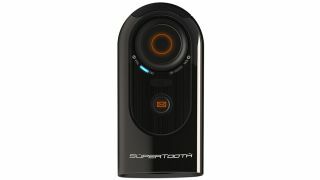 There are two speakers and two microphones on the SuperTooth HD to pick up what you say and play audio clearly. Voice recognition software enables you to set up the Bluetooth connection and receive calls with your voice. One plus: the device supports 12 languages, including Spanish and German. This popular transmitter, which transmits audio from your phone over an FM radio signal, now supports Aha by Harman from your phone. You can configure the app to play almost any radio station, but there's an added bonus. Tune in to a station such as "coffee" or "hungry" and the app will provide reports on new points-of-interest. There are also stations for traffic reports and local weather. Available this spring, this improved (and 35% smaller) radar detector connects to your phone and monitors for police radars in your area. You'll get an alert to slow down, but more importantly, you can share the location of the speed trap with other iRadar users in a community portal. Garmin has an uphill climb now that so many drivers are using their phones for navigation – or the built-in sat nav system. But there is one feature on this new high-end model that could turn heads: a more natural language approach. As you drive, the Garmin Nuvi 3597 LMTHD tells you to "turn left at the gas station", which is more intuitive and helpful that street names and distances. Plus, the new Nuvi has a magnetic connector that pops it into place. Plugging the Delphi Vehicle Diagnostics device into the ODB port on your car can help you understand problems, but it's designed to do much more. Using the related mobile app, you can unlock or lock your car, pop the trunk, and even set a geo-fence that warns you when the car drives out of a predetermined area. Adding audio files to your car is often as simple as plugging in your smartphone. Yet, you might not always want to do that. This USB flash drive, which has 4GB of storage, syncs over Wi-Fi to the internet so you can download media files from your Dropbox, Box.net or Skydrive account. Designed for business travellers who don't want to lose their phone, the Kensington Proximo also makes a great automobile add-on. Leave the sensor in your car, and you can locate where you parked using your smartphone. Or, better yet, attach one to your car keyring so you will never lose them. Not just another navigation system designed for older cars, the SmartGPS offers some of the features of a high-end BMW or Lexus. Namely, you can sync your phone to the device. That means setting a route whenever you want on your phone (or computer), then syncing when you get to the car. The advantage is being able to set more complex routes in your spare time, adding waypoints, and having less stress in the process.